Well presented and tastefully decorated two bedroom main door flat in a traditional detached block of four, located in the Colinton district of Edinburgh. Comprising entrance hallway, living/dining room, kitchen, two double bedrooms and shower room. The property benefits from modern UPVC double glazing, gas central heating and extensive basement storage space. Further benefits include front patio, rear communal garden with three timber sheds, monobloc two car driveway to the front and unrestricted on street parking. Well presented and tastefully decorated two bedroom main door flat in a traditional detached block of four, located in the Colinton district of Edinburgh. Comprising entrance hallway, living/dining room, kitchen, two double bedrooms and shower room. The property benefits from modern UPVC double glazing, gas central heating and extensive basement storage space. Further benefits include front patio, rear communal garden, monobloc two car driveway to the front and unrestricted on street parking. From the rear of the property there are open views across the recreation grounds of Redford Barracks to Caiglockhart Hill and Arthur's Seat. Colinton is a prestigious area within Edinburgh to the South of the City Centre and has a thriving community. It is well placed for access to all local amenities and services which are within walking distance of the property. There is a selection of local shops nearby including a Tesco Superstore, with very well respected primary and secondary schools and leisure and recreational facilities all being near at hand. There is regular public transportation which provides ease of commuting in and around the surrounding areas and to Edinburgh City Centre which is a relatively short journey away. In addition the City Bypass is close at hand which connects to all major routes in and around the City and to further a field. Entrance hallway serving all rooms (except the kitchen) with Karndean wood effect flooring, radiator, pendant light fitting and dado rail. Bight and spacious, carpeted living room with ample dining space and window overlooking the front garden and driveway. Comprising feature fireplace with living flame gas fire, cable TV and phone points, picture rail, halogen spotlight fitting and radiator. 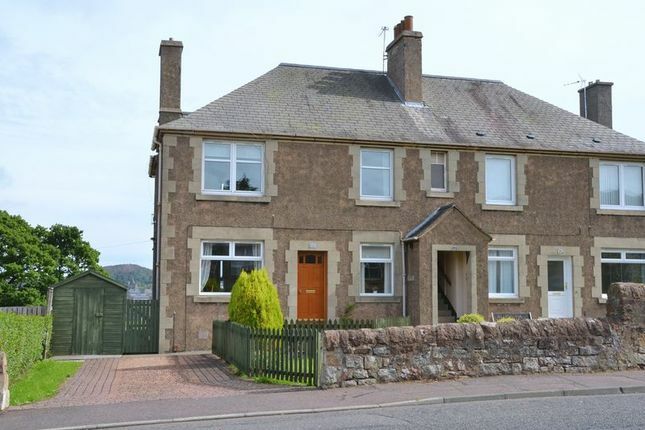 Set to the rear off the living dining room with window overlooking the garden and with open views across to Craiglockhart Hill and Arthur's Seat. Comprising fitted units with laminate worktops, tiled splashbacks, sink with drainer, ceramic hob and electric oven with extractor canopy over, space and plumbing for washing machine and fridge freezer, vinyl flooring, radiator and halogen spotlights. Spacious, carpeted rear facing double bedroom with open views to Craiglockhart Hill over the recreation grounds. Comprising built in wardrobe, picture rail, radiator and halogen spotlights. A further spacious, carpeted double bedroom with window overlooking the front garden. Comprising built in wardrobe, shelved recess, radiator and pendant light fitting. Set to the rear off the hallway with window. Comprising three piece suite including corner shower cubicle with electric shower unit, fully tiled splashbacks with complementary wall tiling, laminate floor tiles, vanity unit with storage, heated towel rail, and ceiling light fitting. One timber shed - sale by separate negotiation.